The company is also known for searching and implementing innovations to process of occupational safety. It offers the best high standard solutions which provide rising effectiveness according to operative standards and provisions in their production facilities. The company is aimed at continuous progress and at expand a range of products. The company implements modern tools to improve distribution, current control of resources consumption and also practical statistics how health and safety may be used in your company. 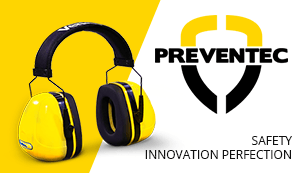 Preventec stands out for another suppliers by flexibility and by adapting their working hours to the client which is why it has always access to necessary measures of protection.